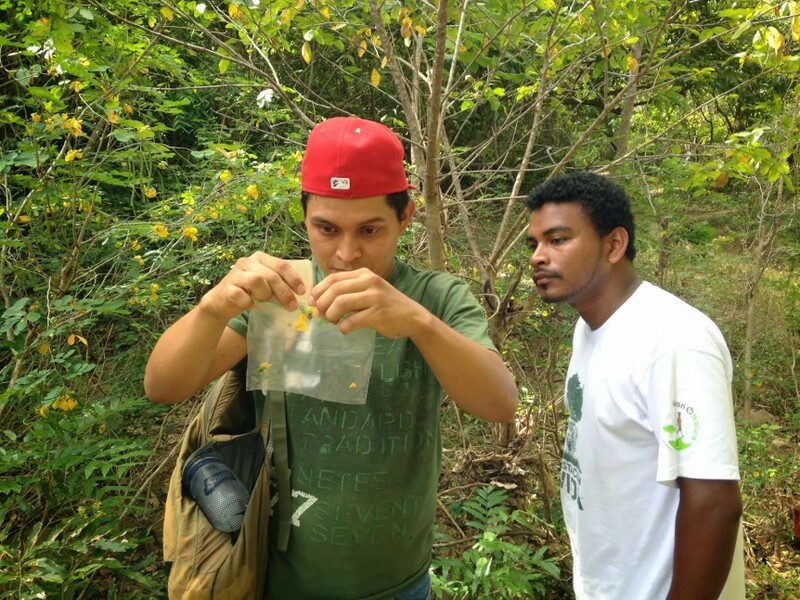 Marcos inspects a Melipona beecheii worker captured at a flowering bush on the property of a beekeeper. It is dry season in Paso del Istmo, with trade winds wicking moisture from the Pacific slope forests causing upwelling of nutrient-rich water offshore. Deciduous tree species are dropping their leaves and tree crowns full of yellow or purple blooms dot the landscape. The dry season blossoms bring increased bee activity and with it a flurry of projects in our meliponiculture program. In the rainy season of 2012, intern Sarah Rudeen and veterinary student Marcos Calero Pérez piloted Paso Pacifico’s bee program by reaching out to keepers of stingless bees in the vicinities of the Flor and Ostayo rivers, gathering data and leading workshops on modern stingless beekeeping techniques developed in Mexico, Brazil, and Costa Rica. Marcos Calero Pérez and intern Richard Joyce are carrying the program forward by assisting in the transfer of hives from logs and branches to wooden boxes. These specially designed boxes allow for less disruptive and more sanitary harvest of honey, easier monitoring, and, most importantly, the ability to divide hives, increasing the number of hives without having to cut trees and branches from the forest. In addition to supporting and promoting the keeping of native stingless bees, we are collecting data on the bee diversity in the isthmus and using pollen samples to better understand the relationships between bees, native flora, and cultivated crops. When dry season comes to a close, we will transition to connecting honey producers with stores in Rivas and Managua where they can get a good price for their product. In addition, we will create a plan for a women’s beekeeping cooperative. Stay tuned for more updates on the project! A rustic log hive in the Ostayo watershed. Paso Pacifico is helping beekeepers transfer hives to boxes that facilitate harvest and hive division. Marcos Calero Pérez teaches children the basics of Melipona bee biology. Roble de sabana, a dry season blooming tree. Bait for attracting swarms of Tetragonisca angustula, a small stingless bee whose honey is highly medicinal for eye ailments. Special thanks to author and photographer Richard Joyce! Muy buen trabajo, felicitaciones de parte de Meliponas de Nicaragua. La cría de abejas nativas no es apicultura es meliponicultura dado que las abejas son del genero meliponas y son muy diferentes a las del genero apis sp.